Couples therapy is usually the right thing to do when you are facing some difficulty between you such as an affair or repetitive conflicts. You may feel that your relationship is losing intimacy and you wish to reconnect with each other or are finding it hard to adjust to the changing phases which your relationship is experiencing. The main purpose of couples therapy is to improve your knowledge about yourself, your partner and the way you relate with each other. With increasing knowledge of these three areas it becomes possible to break the repetitive patterns you may find yourselves in, increase intimacy between you and find ways of growing together. I have worked as a couples therapist for about 10 years seeing couples for weekly sessions. 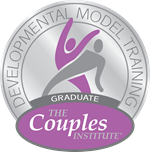 Working with couples is a major part of my work as a therapist. If you would like to arrange an initial consultation then please call me on 07941 488851 or Email Me and we can discuss what you need and how I may be of help. 249a Otley Road, Leeds, LS16 5LQ. Telephone 07941 488851 .